What a crisp, clear and sunny morning, though brutally cold, I must say. It was about 15 degrees out with a good, solid wind coming from the NE. 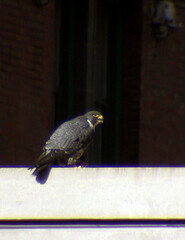 The male was again on the Board of Trade Annex when I arrived. I got set up as quick as I could and tried using my new telephoto in hopes that I’d get his legband numbers. Alas, he kept his body between me and his left leg at all times, causing his left legbands to be drowned in deep shadow. He was vigorously plucking another flicker and proceeded to eat the thing with gusto, his back turned my way. 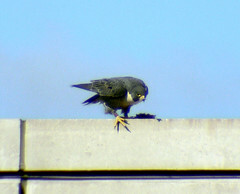 I saw yet more flicker parts on the stairwell roof, so it looks like they are still using that as an eating perch. And, wow, they are also doing their part to keep the flicker population in check! As I was walking home through Grant Park later that afternoon, I saw hundreds of flickers, so I can see why they are picking on them right now. At some point, the female swooped in and the male took off. She landed, hopped to the remains of the flicker and took off with it, flying to the south, around the jail and out of sight. The male circled overhead for a time and then landed back on the corner of the annex to sunbathe. Again, he turned his back to me, so I couldn’t see his legbands. I’ll get him one of these times! He definitely noticed me, but didn’t seem all that bothered. He did give me a nice “Kleeeeek” at some point as he stared directly at me, but then he settled down on his feet to preen, so he obviously wasn’t bothered. In looking at the pictures I took, the telephoto definitely brings things closer, but I am less than enthused about the bright blue light fringing I’m getting. Maybe I’ll go into Central Camera and talk to the guys about what I can do about that. In the one picture I took that may have given me a look at the legband, the blue fringe obliterates the numbers. DANG!! ~ by Steph on April 5, 2007.